For the next few weeks I have the pleasure (and I use that term loosely) of bird sitting my brothers Alexandrine Parrot named Richie. He is rather noisy and there seems to be bird seed spread everywhere as he enjoys throwing it around. But the noise, so very loud, the talking, screeching and whistling, it seems to never end (especially if you get on the phone). His favourite sayings consist of repeating “Richie birdman” or squawking “Jack, Jack, Jack” (which is his canine brothers name). Amongst all of Richie’s chatter my eight year old asked me why do only some birds talk and how do they learn to talk, so I thought I would share the answers (and more) with you all. Birds don’t actually have vocal cords, instead they use muscles and membranes, in particular the syrinx, to make sounds and tones. Using the syrinx, which is located at the base of the bird’s trachea, they have the ability to learn how to speak, whistle and/or copy environmental sounds (such as ringtones, sirens or doorbells etc). 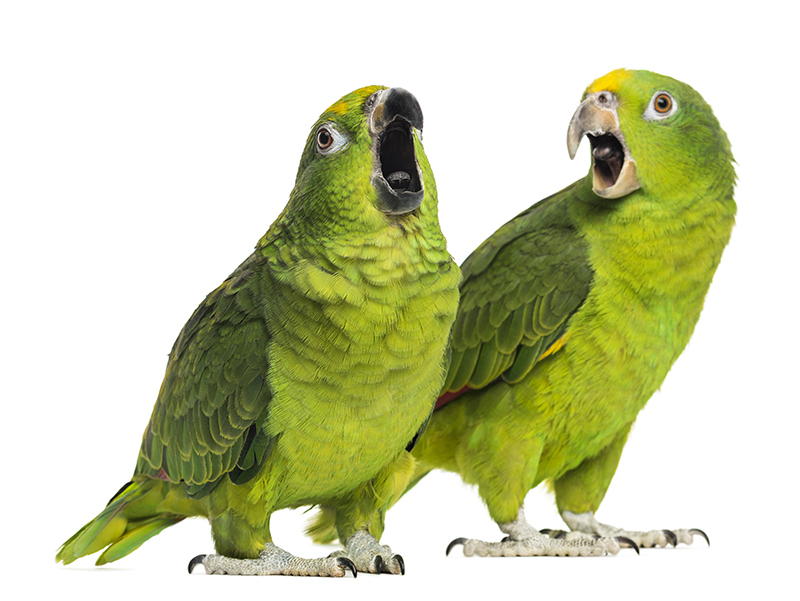 Some birds can develop complex communication skills with the ability to speak up to 2000 words. Some species of birds will talk and have more ability to mimic human voices and environmental sounds than others, with Songbirds and Parrots being the best at speaking. Even some wild birds, like magpies, particularly ones that interact with humans can learn how to talk and mimic sounds. Vocalisation and talking is more dominant in social birds that are happy, healthy and confident, with males being more likely to talk than females. Birds can even teach each other to talk. This has occurred in cages and when once tame birds have escaped and joined a wild flock saying words which the other birds then learn and repeat. Starting at a young age is the best way to get them chatting, or if you get an older bird that already knows some words they can usually continue to learn more. Birds are most likely to learn from and mimic the person they have the strongest bond with and feel comfortable with. Start with small simple words they will hear a lot, like their name. Use association techniques, like naming foods and repeating the name as you give or show it to them. Greeting the bird when you enter the room and saying goodbye as you leave is an easy way to repeat a word with an action of you coming or going helps them learn to say it. Speak enthusiastically and energetically this words seem more interesting and direct making the bird more likely to learn them. This is why many birds say swear words or phrases such as “shut-up”, “be quiet” or “stop it”. Make it fun and reward them for trying or making sounds by using treats, pats and positive reinforcement. Be patient! Teaching a bird to speak can take a long time or may never happen at all. Whether they are the silent type or a chatterbox, birds make great pets and are intelligent meaning they can be trained to do tricks and interact with people in different ways.